LED lights, or ‘light emitting diodes’ have slowly taken over other lighting fixtures. Gone are the flimsy filament bulbs, and in their place LED lights. 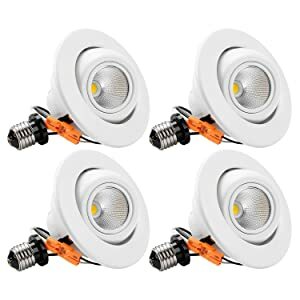 These lights are designed to perform much better than older versions. LED recessed lighting can be found in a wide variety of different places. From residential to commercial areas, the best LED recessed lighting is used everywhere. Its versatility is another reason why people are drawn to these lights. How to Choose LED Recessed Lighting? How to Install LED Recessed Lighting? LED recessed lighting has a lot to offer to users. More and more people are switching over to LED light bulbs to take advantage of them. Energy Savings: LEDs save more energy when compared to incandescent bulbs, CFLs, and fluorescent tubes. An LED light requires 85% less energy to power a bulb than incandescent light bulbs. Similarly, it uses 50% less energy than a CFL to power. Less Heat: Because LEDs use less energy, they don’t heat up as other bulbs do. This reduces the strain put on air conditioning systems, as well as the bulb itself. Quality: One major con for LED lights is the quality. Many people complain that LED lights look very unnatural compared to other bulbs. While this isn’t an issue for everyone, LEDs tend to look bluish compared to other light fixtures. LED recessed lights are great, but finding a high-quality bulb is difficult. There are many brands that promise good lighting but fall short on deliverance. Here’s a list of potential LED recessed lights you can use in your home. The first review is of the Torchstar ultra-thin recessed light. This light is very thin, as the name suggests, and is perfect for narrow ceilings. In fact, it only requires two inches of ceiling clearance for installation. 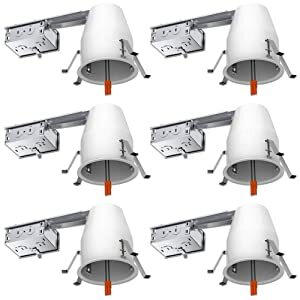 Speaking of installation, the Torchstar recessed light requires very little time to install. A junction box is provided, so most of the hard work is taken care of. The bulb itself has a frosted LED lens and is also scratch resistant. There’s also a sponge gasket that seals the bulb to avoid any corrosion while it’s attached. One con about using the Torchstar is that the junction box tends to pop open occasionally. This problem could be solved with a screw on application, but the clip spring isn’t very sturdy. The second review is for Sunco’s IC housing LED light. This LED light is IC rated, meaning it’s been rigorously tested for quality assurance. It’s a very safe and secure LED light to use in every area of your home. The design of this specific Sunco light makes is perfect to use around your home. It goes great in a bathroom, bedroom, basement, or even office. The design takes up minimal space, so you don’t have to worry about clutter or crowdedness. One negative point about using the Sunco light is the maintenance level can be high for these lights. The installation process is fairly simple, but many users complained of the fit on the sides. The product was difficult to mount in a secure way and took many tries to get it to stay in place. Next up is the Hyperikon recessed downlight. 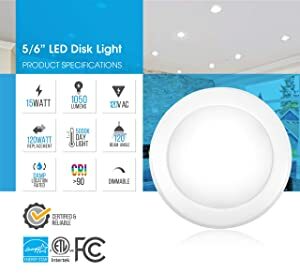 This LED light is certified by Energy Star and Underwriter Laboratories. It has met their standards, and as both are regulating organizations, it’s very safe to use. The Hyperikon recessed downlight burns at an impressive 950 lumens. 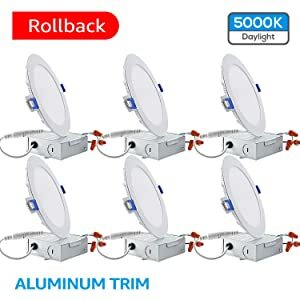 So, this is a great option for those places that need clear and bright light. It’s perfect for bathroom mirrors and basements, where light makes all the difference. A great feature that the Hyperikon recessed downlight has is that it’s customizable. You can control how bright or dim it is, from 20-100% brightness. It allows more flexibility in where you place it, as you can always change the brightness level. The Hyperikon recessed light comes with a five-year warranty. This warranty is unlimited and covers everything within the first five years. This is something that not all brands offer, so it’s definitely a plus. One con about using the Hyperikon recessed light is that there’s a slight buzz that occurs while it’s in use. When the product is turned on, some customers complained of hearing a buzzing sound. Other LED lights don’t have this problem, but it could be an issue for you. Next up is the Lithonia recessed ceiling light. It has different options on colors of lights. There are options like daylight, bright white, cool white, and many others to choose from. This light is also very thin and can easily fit into any narrow ceiling area. It can easily be installed and is even compatible with sensor switch dimmers. The Lithonia light is one of the brightest lights on this list. It burns at a great rate of 1,020 lumens and can also be dimmed accordingly. One negative effect of using the Lithonia light is that it emits a buzzing sound. This sound is heard when the light is powered to any place between the minimum and maximum power. The only times it doesn’t make a buzzing sound is when it’s at its highest or lowest power. Only the highest and lowest powers don’t emit the sound. This is troublesome when you want to adjust the brightness in the room. The next review is about the Globe recessed downlight. This type of LED light is great for specialized areas like showrooms or art exhibits. The globe shape allows for focused energy on a single point and keeps it well lit. The Globe LED light is easy to install with its clip hooks. These clips are adjustable and extra wide, so it’s easier to grip onto uneven surfaces. The Globe LED light is also IC rated, so you can use it near insulated areas without worrying about overheating. It automatically cuts off power to the bulb when it gets too hot. One con about using the Globe LED light is the installation process isn’t very smooth. A problem that many users ran into with this product was that the light had trouble staying in place. The clip that’s supposed to hold the bulb is a little loose and doesn’t secure it properly. The next review is for the Sunco retrofit LED light. The Sunco lighting retrofit LED light offers users many advantages. It’s UL certified and listed with Energy Star, ensuring all products are up to date with standards. The Sunco LED light can be used in remodeling, as well as in new design settings. These lights work great in both small and large areas. This light also has a five-year warranty, so that means less visits from an electrician. You can just have your product replaced for free with the company that made it! The problem with the Sunco lights is that some bulbs have an afterglow even after powering them off. This can be a problem for the integrity of the bulb itself and reduce the lifespan. 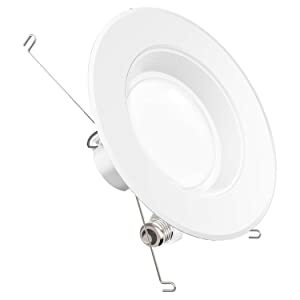 Coming to the end of the list is the Torchstar gimbal recessed downlight. This product is great for who want a long lasting item. It can function well for upwards of 16 years with six-hour daily use. The Torchstar gimbal LED light is fully adjustable. Not only can you change the beam direction, but you can switch between lightings. Directional lighting, focused lighting, and sloped ceilings are all possible with this LED. One problem that you might run into while using the Torchstar gimbal LED light is flickering. After some time, these lights can start to flicker when you dim them. It doesn’t occur on a daily basis, but with time, they definitely start to lose their quality. When you turn the lights to a lower setting than the default one, you might notice that they flicker. This is especially true on the lowest or dimmest setting. They flicker especially often during this time. Last, but not least, is the Parmida recessed ceiling lights. This product is best applied in new construction or retrofit, as the name suggests. However, you can really use it anywhere that needs good lighting. The Parmida LED lights are perfect because they’re easy to install and have a very long lifespan. Customers are able to use them for many years before any need for an electrician. They are also dimmable, allowing for more customization. You can also choose from different colors of lights to further customize your room. One big issue with this product is that it tends to heat up around the base. Light bulbs that heat up are not very safe to use, regardless of if they’re certified by regulators. Some customers have complained about this issue, so it’s definitely important to know. Now that you have an idea of the different types of LED recessed lights out there, what’s the next step? How can you choose LED lights that are a good fit for your home? Here are some things you should consider before buying an LED recessed light. Baffle Trim: The Baffle trim has a ribbed interior that helps minimize glare against the frame. This is the most common type of trim used. Reflector Trim: This trim utilizes a mirrored surface to reflect the light and add more brightness. There are options for tinting with this type of trim. Gimbal Trim: This trim great for focusing light. The lamp doesn’t extend out of the socket as much, and when it’s turned, the housing can block the light. Aside from these trims, there are many other recessed light LEDs you can check out. The IC rating is an important factor when it comes to deciding on whether to buy the light or not. This determines the type of areas you can use your bulb in. You can consult an electrician to fully understand what types of bulbs you can use in your home. If a bulb is IC rated, that means it’s configured in a way that can be used around insulation. As bulbs naturally get hotter when they’re in use, insulation can become a problem with this heat. IC rated bulbs have an insulated contact rated fixture that keeps the heats away from the rest of the home. If a bulb is not IC rated, that means it’s not a good option for using around insulation. Sometimes, this isn’t an issue. If you place the bulb in an area where the heat has enough empty room to escape, there shouldn’t be a safety issue. It’s also important to think about how much it’s going to cost to install the lights. This depends on how many lights you buy, as well as whether you install them yourself or get it serviced. You should also factor in the costs for energy savings you can get by using LED lights. The type of lights you buy depends on how you want your room to look. Certain lights look better in certain types of room placements. Your room layout plays a big part in the type of lights that are effective. How you want to use your lights also matters. Do you want a focused light or something that’s broader? Take some time to think about the functions of the lights and what you want them to do. Start by removing the old fixture and junction box. Take care to avoid cutting and damaging any wires for safety purposes. Measure the hole of the old fixture to figure out how much you need to have for your new one. This is commonly around four to six inches in diameter. Cut the new hole. Next, connect and secure the new wiring. Pair the wires from the attached junction box to the wires in the ceiling. Take care to connect the color-coded wires correctly. Now you can insert the housing or ‘can’ for the light fixture. Once that’s done, attach the corresponding baffle and trim. Make sure they’re both lying flush against the ceiling to avoid holes. Finally, you’re ready to attach a bulb and use your recessed lighting! How to Install Recessed Lighting Step by Step with Picture. LED recessed lighting is useful for many reasons. Besides saving you money, these lights are easier to install and last for much longer than others. With the proper research, you can also take advantage of these bright bulbs and add them to your home.